Factoring in the possibility of an earthquake or seismic event when evaluating soil conditions for a bridge replacement near the Kentucky and Tennessee border is not usually a consideration. However, for the $449 million Lake Bridges project in the Land Between the Lakes region in western Kentucky, it was crucial. 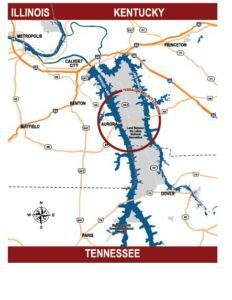 Seismic loading demands had to be taken into consideration for this project due to the proximity of Kentucky Lake and Lake Barkley to the New Madrid Seismic Zone, also known as the New Madrid Fault Line. As the first lake crossings below the lakes’ dams, the possibility of added seismic stress on the bridges’ structural elements due to the nearby fault line had to be included in a thorough geotechnical evaluation. Considered vital to the region’s economy when complete, the two new bridges will have four, 11-foot-wide lanes as well as four-foot-wide shoulders and a 10-foot-wide multi-use path for pedestrians and cyclists. The project will make travel in the area much more convenient and open up recreation and economic development opportunities in western Kentucky. made this project memorable,” he stated. The Terracon team of engineers, scientists, and technicians, provided the geotechnical site characterization and design parameters for the new bridge foundations. Using a suite of site characterization tools, our team evaluated the alluvial clay, sand, chert, and limestone stratigraphies. The team used a combination of data gathering methods including shear wave geophysical work (seismic reflection and downhole tests), Standard Penetration Tests (SPT), Cone Penetration Tests (CPT), Pressuremeter Tests (PMT), and rock coring, all simultaneously conducted from up to three barges. Site characterization results made way for a unique design solution. The Kentucky Lake Bridge piers are supported on 6-foot-diameter driven pipe piles with constrictor plates positioned about 50 feet above the pile tips. As an alternative to shafts, these allowed enough pile penetration to develop lateral resistance to barge impact and earthquake loads, needing then only to be driven a relatively short distance to develop the required axial resistance by forcing a soil plug inside the pile. Terracon developed plans for a design phase pile load test program, contract notes for installation and monitoring of the pipe piles, and assisted KYTC with the review of contractor submittals and pile monitoring data for the acceptance of the piles. With the right design solution in hand, the 550-foot-long main span arch, constructed on barges, was able to be floated out and lifted into place in just one day, a sight Ron now adds to his list of career highlights. 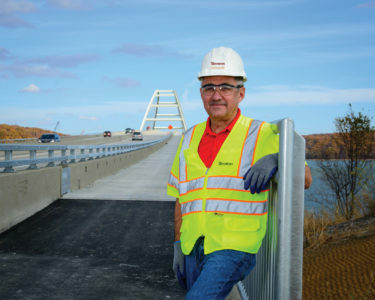 “Seeing the bridge lifted onto the piers and knowing the years of preparation that went into the project was incredibly rewarding for our entire team,” said Ron. The Kentucky Lake Bridge was completed in August and construction is under way on the sister bridge over Lake Barkley. As one of Terracon’s largest-ever geotechnical transportation projects, it is a showcase for not only Ron, but also KYTC and our entire company. Ron Ebelhar, P.E., D.GE, F.ASCE, F.ASTM, is a senior principal in our Cincinnati office. As a project manager for geotechnical and environmental engineering projects worldwide, Ron has provided design, consulting, and diagnostic engineering services for commercial, industrial, transportation, waste disposal, and public utility projects; geotechnical engineering design and construction, including site soil response under seismic, cyclic, and dynamic loading; and marine geosciences and engineering field explorations. He is a registered professional engineer in eight states.